Bayhorse, Idaho -- the last known residence of "the Bulgarian Monk"
Back in September, I discussed the incredible story of Rev. A.N. Experidon, better known as “The Bulgarian Monk.” (Click here for the podcast, and here for the OH.org articles.) To briefly recap, for those of you who are unfamiliar with the story: “The Bulgarian Monk” was the stage name of Fr. Experidon, who claimed to be a Bulgarian monk from Jerusalem. He was in America from the 1870s until his apparent death in the early 1890s. He was an amazing character, traveling all over the United States and giving lectures on street corners and in small-town opera houses. He befriended many politicians of his day, tried to convert Brigham Young to Orthodoxy, and probably drowned in Idaho around 1891 or so. It was at this latter place [the mining camp of Bay Horse, Idaho] that I met for the first and only time a strange, wild man of the mountains, who was spoken of as the “Bulgarian monk.” He carried a gun, and was followed by a dog. Occasionally he would descend from the hills, where he led a solitary life in the woods, to a mining-camp, and preach the Gospel to those who were attracted by his weird appearance and mysterious personality. He affected the conventional dress and bearing of the apostles, and seemed to consider himself a sort of modern John the Baptist. By the more superstitious and impressionable he was regarded with much awe and wonder; by others, and especially the young, he was greatly feared, and mothers would conjure with his name in keeping their children in the path of obedience. Whence he came and whither he went, no one knew. His movements were enshrouded in mystery. I tried to engage him in conversation and elicit from him some information as to his life and purpose. But my efforts were unavailing. As the weather grew cold in the autumn he would disappear, not to be seen again until the winter had passed and the snow had melted in the mountains. Then with his rifle and faithful dog he would once more be seen in the woods. Whenever he condescended to come to a settlement, it was only for a brief hour, to deliver his message or warning, and then disappear. He repelled all attempts to draw him into conversation, nor would he accept hospitality or kindness from any one. He suddenly ceased to make annual visits, and no one seemed to be able to solve the enigma of his life. On the occasion of my seeing him at Bay Horse he was just leaving that place, and I can vividly recall his curiously clad retreating figure, as he climbed the mountain and disappeared among the pines. Every community has its own eccentric character – an oddly dressed or reclusive man or woman, seeking no meaningful friendships, yet amiable enough when spoken to. In Bayhorse, Idaho, the recluse was known by all as the “Bulgarian Monk of the Church of Jerusalem.” Some said the monk had no ecclesiastical credentials because he never saved anyone from sin. But that scarcely mattered. He did look somewhat churchly, a young man, tall and lean with a long, black cloak flapping about his ankles and a red fez perched atop his head. He claimed to speak thirty-two languages and said he’d been a guide for Mark Twain in the Holy Land. All quite credible in nineteenth-century Idaho. Two weary horses and a scrawny dog accompanied the monk as he wandered from one mining camp to another along the Salmon River. He never caused any trouble and if his strange appearance brought a comment from a newcomer to the area, the old-timers would say, “Oh, he’s a harmless coot. Just part of the scenery.” And they always said it with respect, for they both admired and sometimes feared this “missionary man” who lived among them. What proselytizing he did came in tolerable doses. Rumor had it that the monk had a tiny cabin somewhere in the woods and that he was hospitable enough to the few lost travelers who stumbled to his door. He always left provisions for the taking. The monk fished and hunted, his scarlet cap warning other hunters of his presence in the wilderness. Although generally he was uneasy with adults, children loved him. They came running from all directions when he stopped by the village store for supplies. It was as if they knew he was coming before they ever saw him. The smaller children thought he was so tall because he probably walked on stilts. At other times he would sprint down the road chasing after the children, the sides of his cloak flapping like giant wings, gales of laughter greeting the startled passersby. Of course, he never caught them, for that would spoil the game. He would always fall flat on his face and cry and beat the ground, as if in great suffering. In the harsh winter of 1890, shortly before Idaho became a state, the Bulgarian Monk vanished. A blizzard blew for endless days, the temperature dropped, and ice-crusted snow made it dangerous for search parties looking for stranded prospectors and families. Avalanches killed many miners, and trains between Shoshone and Ketchum were snowbound for days. Livestock and wild game starved. And when the storm abated, people started reappearing, searching for family and friends. 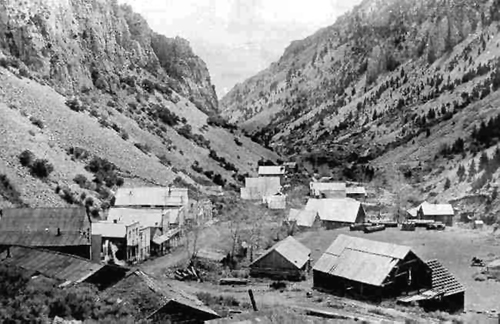 The old mining town of Galena had been hardest hit, but many had escaped in time. And where was the monk? Some said he was in Bellevue, Idaho. He wasn’t. Another said he’d seen him in Shoshone. He wasn’t there either. Children sobbed, fearing their friend had died in an avalanche. In February 1891, the rains came. Roofs weakened by the weight of snow now collapsed under tons of water. Legend has it that in one section of Hailey Hot Springs people burned a whole block of shanties just trying to keep warm. Meanwhile, a few miles outside Bayhorse, the Bulgarian Monk set about repairing his remarkably undamaged cabin. Some slabs of siding were gone and the roof had sprung a few leaks. He left for Bayhorse and the supplies he would need. At the village limits, he heard the running and the laughing of youngsters, and his heart quickened. He’d give them a good race this time. But, as he leaped over a boulder, he lost his balance and fell into the rain-swollen river. Pieces of his robe were found later tangled in some brush near the riverbank. The children wept and their parents mourned their lost apostle. Yet two weeks later a visitor arrived in Bayhorse and was shocked by reporters of the Monk’s death. On the day of the supposed drowning, the stranger said, the monk was twenty-five miles away, playing with the children at Yankee Fork, Idaho. Could the monk have been in two places at once? Not likely. But soon riders traveling the areas of Bayhorse, Bonanza, and Yankee Fork told of seeing a black-robed figure pacing the riverbanks. He held a lantern high in his hand, but always vanished at the approach of a rider. Was it the Bulgarian Monk searching for his mortal remains? The questions still provide plenty of speculation around campfires in the Sawtooth National Forest. In the 2005 book Weird U.S., the authors say that the Bulgarian Monk was “a strange young man” who “was actually no monk at all, but locals took to calling him that because of his odd choice in garb. He wore hooded burlap robes that he tied off at the waist.” They tell the same basic story — the Bulgarian Monk drowned, and then turned into a ghost. None of the ghost story writers are aware of Fr. Experidon, as an historical figure. From those stories, you get the sense that this Bulgarian Monk was a crazy young man from Idaho, not a well-traveled lecturer and raconteur in his sixties. Of course, it’s not like these ghost story writers are historians, concerned with factual details. I actually emailed Michael Norman (coauthor of Historic Haunted America) awhile back, and he couldn’t provide me with any sources for the above story. It’s pretty easy to see how these ghost stories would develop, though. Bishop Ethelbert Talbot said that “mothers would conjure with his name in keeping their children in the path of obedience” — Don’t make me call the Bulgarian Monk! The children who grew up in the 1880s and early 1890s would have known him personally, as a strange and frightening figure. Given this hold he apparently had on the imaginations of the locals, it’s not surprising that kids would tell campfire stories about him after his death. This would be especially likely if, as the stories say, his body was never found. The Bulgarian Monk is not a ghost, haunting a remote region in Idaho. That said, his last known residence — Bayhorse, Idaho — is now a ghost town. Just last year, it became part of a state park, and it’s now open to the public.